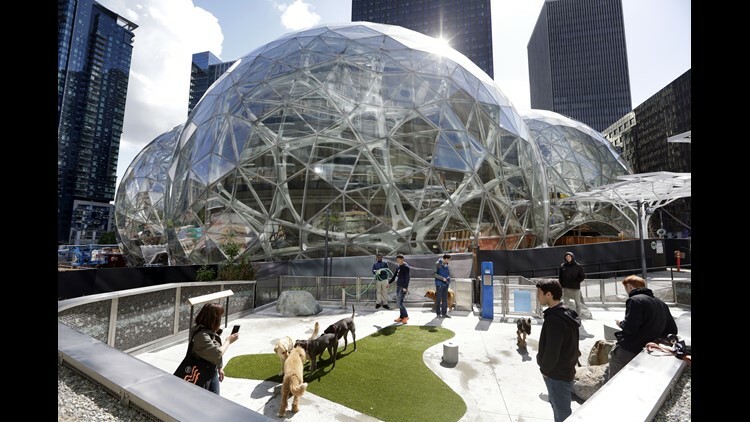 Amazon employees tend to their dogs in a canine play area adjacent to where construction continues on three large, glass-covered domes as part of an expansion of the Amazon.com campus, Thursday, April 27, 2017, in downtown Seattle. In 2017, Amazon.com announced it was seeking a second North American headquarters which, once built out, would employ up to 50,000 high-tech workers. This set off a race among big cities eager to house the world's most valuable company and its well-paid employees. 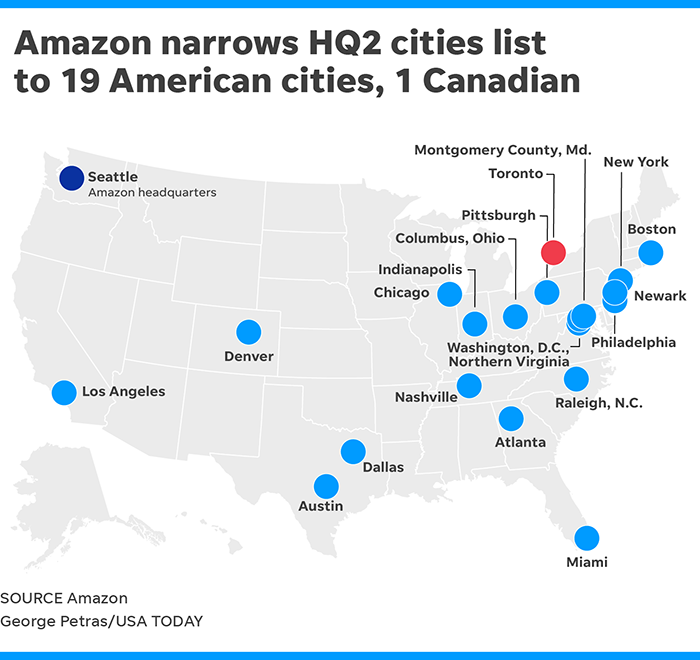 The Seattle-based online retailer founded and run by billionaire Jeff Bezos, the world's richest man, said its "HQ2" would result in close to $5 billion in investment in the chosen city. The company said it would prioritize metropolitan areas with more than 1 million people and that it was encouraging interested communities to think "big" and "creatively" about possible locations. Amazon is founded in Bellevue, Washington. Later that year the small company moves to an office in Seattle. Amazon.com launches online, selling only books. Amazon has an estimated 10,000 employees in Seattle. Amazon announces it is searching for a second headquarters, one that will be co-equal to its Seattle home. It posts a Request for Proposal outlining what information it requires from cities that want to be considered. At the time, Amazon was estimated to have about 40,000 employees in Seattle. The company occupied 19 percent of all prime office space in the city, according to an analysis by The Seattle Times. Deadline for cities to submit their applications. In all, 238 proposals were received from across the United States and Canada. Amazon teams visit all 20 cities/areas, a process that the company – and the cities – largely keep under wraps. Speaking at the Economic Club of Washington D.C., Amazon CEO Jeff Bezos said the company would announce a decision before the end of the year. After it became clear finding a city that could lure 50,000 highly-paid tech workers wasn't as easy as it had thought, Amazon pivots and instead decides to add two new headquarters instead of one. The two cities to be chosen aren't named, but Northern Virginia and New York City are at the top of most lists. Amazon chooses New York City and Arlington county, Virginia, as the destinations for its next headquarters.